After coordinating and attending numerous weddings, I’ve seen the “dos” and “don’ts.” In order to make your big day less stressful and perhaps save some money, here are our Top 5 Tips! 1. Tip – Leave two days after the wedding for your honeymoon. Reason – Every minute of your wedding day will have a to-do. At the end of the night, you and your new husband will be exhausted from the day’s events. Take the day after the wedding to relax, unwind and reflect on your wedding. That extra day will allow you time to feel refreshed and ready to travel. 2. Tip – Customize your garter. Reason – It’s all about the details. My husband is a huge Dallas Cowboys fan. I wanted to surprise him with a customized garter. I simply went to a local craft store and bought a plain white garter. I then hot glued a Dallas Cowboys star onto the garter (also found at the craft store). My garter was extremely inexpensive but the look on my husband’s face when he realized it was customized for him was priceless. 3. Tip – Have a family member videotape your wedding. Reason – This will save you a ton of money. Videographers are very expensive. Why not budget that money for something else like custom linens or a band? You’ll enjoy watching your wedding video for years, regardless of whether or not it was professionally filmed. 4. Tip – Add your honeymoon to your registry. Reason – This is a terrific idea that will make your honeymoon even more memorable. I wish I had known about this when I got married. You can now register your honeymoon online and guests can then make donations or buy you and your husband excursions like a sunset cruise or couple’s massage. Check out this site for more. Because really, do you need another blender to return? 5. Tip – Create a unique guestbook. Reason – You certainly want to document the attendants at your wedding, but will you really place a white laced book on your coffee table? I attended a wedding recently where the couple had created a photo book of their relationship together. They left space on each page for the guests to sign. Not only did it provide the guests something to look at before the wedding began, it was also a keepsake that can be displayed in any room of their house. Be creative and come up with something unique for your guests to sign. I’d love to hear some of your tips and ideas! Feel free to leave a comment with something innovative and creative you recently saw at a wedding or event! What Do Respondents Think About Wedding Planning? Greenfield Online/Ciao Surveys asked approximately 1,200 respondents if they had ever had a wedding celebration/reception. The following chart shows how many guests that respondents invited to their wedding reception. 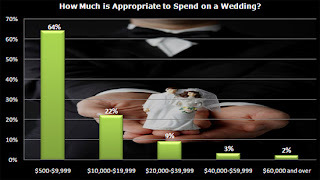 When asked how much respondents think is appropriate to spend on a reception, here is what they found.